When parting with my hard earn cash, please forgive me if I tend not to buy things out of my comfort zone, but I know what works best for me- the makeup that never lets me down or fails to disappoint me. I often find buying colours,shades and products that I don't know very well, kind of daunting. 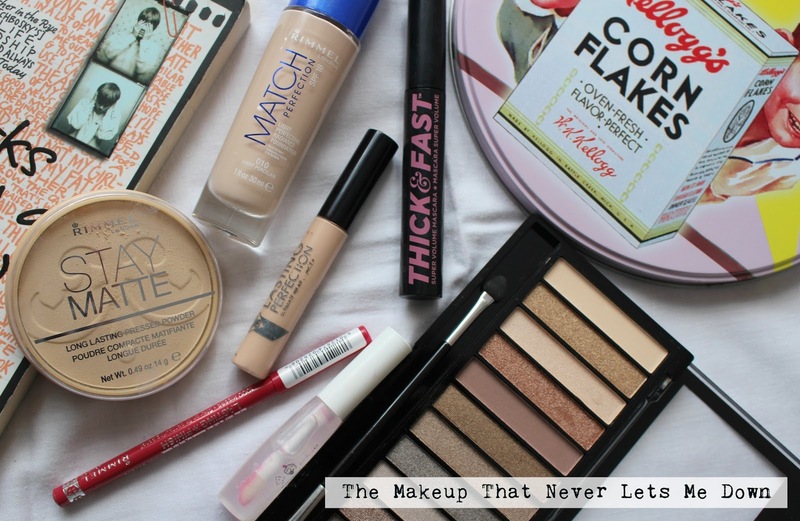 So here are my essential items that I can always rely on, when buying new makeup when I go shopping! In the photo, I have chosen the Rimmel stay matte powder, but really any powder is a must! It stops your makeup dripping of your face and stops you looking like you have just been on a very sweaty, long run. Anything that claims, it is mattifying is definitely going to get my attention in the shop. You know when you have those rare days, where you skin isn't actually that bad but you still look a bit 'dead' This is where a light coverage foundation such as the rimmel match perfection comes in. It provides a nice bit of coverage, it never lets you down but can't really fight any spots! Many concealers don't actually do much for your skin, but the lasting perfection one actually covers up any indication on your face, that says you have been awake half the night on Tumblr. Clear Lip gloss, like this one from Avon, can never let you down. Its an absolute staple in my makeup bag, whenever you are in 'makeup' state of emergency, a clear lip gloss can come to your rescue. I pinched some of my sisters Rimmel Match Perfection foundation and really liked it, I'm not too sure why I haven't picked it up myself yet. I love natural eyes and a fuschia lip too! Love the idea of this post! I love the powder, I use it all the time! lovely product choice, I use this powder every day without fail! I love Rimmel`s face and lips products,they`re amazing and in terms of quality they can seriously compete with some high-end brands. Love your selection, most of these are my faves.